It’s pretty much a guarantee that whatever winery Biondivino chooses to host for a tasting, the offer will be great. And such was the case with David Rosso of Giovanni Ross pouring a few bottles of his Piedmont winery’s offer. We managed to get there in time to still taste a bit of their lower-end $25 a bottle wine, the 2009 Babera d’Alba. 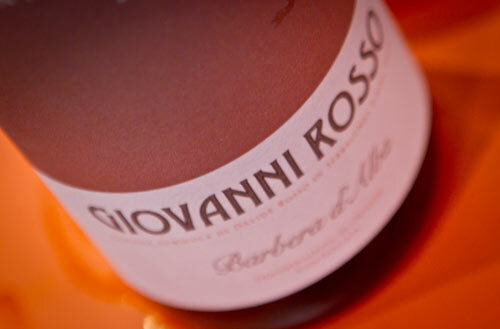 It has good acidity and bright fruits to it that give off a cherry and peach elements. A good food wine, which is almost redundant to say when it comes to Italian wines. Then we also managed to get the last bit of the 2007 Barolo Cerretta that they had decanted for the evening. At $98 a bottle, this is not a wine that most of us will have on a regular basis. Those who do, I envy you… What is there to be said about it, it’s an Italian Barolo. Highly structured, elegant, a body that is strong, yet gives way to expose light elements of oak, and then of course has a lingering, yet pleasing finish. Yes, it’s expensive, but such is how it goes when you want an elegant Barolo. If you want one for less than $20, head to Trader Joe’s, but be prepared for disappointment. David told us that his aging process involves a month of concrete tanks prior to aging in large oak (2,300L) botti and then straight to the bottle. He’s one of the growing number of winemakers who enjoys the highly neutral quality of the concrete tanks that eschews the reductive process you can see in stainless steel. As always, a very enjoyable tasting from Biondivino and for those looking for a treat, head on by this Sunday, the 30th from 12-3PM for The Waffle Man brunch offerings.